It took me awhile to get the three beds cleaned up, turned and refreshed with new soil. Seems I move much slower these days, but the two 4 x 4 beds and the one 4 x 8 bed are all ready, and while I've gotten a few things planted, I'm still trying to decide what else I might plant. He was climbing up into the veggie beds and while he can actually fit through these pieces, I'm hoping it will at least discourage him a bit. As far as planting goes, last year I planted 2 crookneck squash plants in my larger 4 x 8 foot bed, and since with square foot gardening, each plant absorbs 9 squares out of the bed, those two plantings took up most of that bed. I think I've about convinced myself not to plant those this year. While I did get some squash out of the two plants before they succumbed to "something," I really don't think the return was worth the land investment. I love them, but honestly they are pretty cheap at the grocery store when they are in season. If I plant one, I may do it out in the midst of the yard somewhere in spot of its own. At any rate, that leaves me lots of extra squares to plant other things so I've got to decide what else I want to plant. My mind seems so sluggish here lately for some reason, so I haven't been able to think or decide! I did pick up an onion set from the garden center that just said "sweet onion" on it. I have no idea how that will do here, but I thought at the very least maybe the onion would help to act as a repellent for bugs. I know that Jerry Baker uses pulverized onion in some of his book formulas, so maybe... though, I might be dreaming. :) The Square Foot Book says to do 16 per square - seemed hard to believe to me, but okay. We'll see what happens! I found a couple of mystery plants growing in the compost pile, so I pulled them and stuck them into a bed just to see if they grew, and if they did, what they are! I love mystery plants. I kept my mint in a pot again, though for now I've just set the pot onto a square in the herb garden and actually this is the same mint plant from last year that I've managed to keep alive. I also put one Better Boy tomato plant in my Topsy Turvy planter this year and moved it onto a plant stand in the middle of the yard, though it's actually a new planter. Note: Do not just leave your Topsy Turvy planter out in the elements over the winter, even if you have mild winters, or it just might dry rot. The tomatoes in the Topsy didn't perform well last year on the edge of the eave of the house, though I'm not really certain why it didn't, but I did want to give it another shot. I'm hoping that moving it out to the yard on a plant stand will help, but it is pretty heavy and bending the rack forward quite a bit. I hope the stand is going to be able to hold up without collapsing and dropping and breaking my plant like last year when it fell! 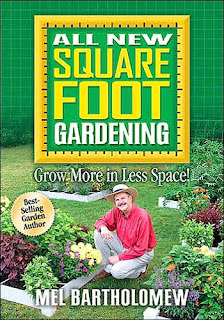 Click right here for my past Square Foot Gardening Quick Links - how to build a square foot garden from scratch, day 1, the trials & errors. Here is the chart of what I have planted so far in my 2010 square foot garden beds- more to come as I make up my mind! I recognized the basil in the first pic! Oh hon, watch that spearmint. When I lived in N.O. it went out thru the bottom and got out that way, and you know once mint is out, it's OUT and taking over the world!!! Yep Pam, and it's in the same spot as last year. Different plant though, but same spot! Oh yeah Holly, that mint is only there temporarily to get it out of the way. It won't live there for long. I usually move it around, but didn't want the puppy to get into it while I was preoccupied. As for the puppy, it looks like the All-American Heinz’s 57 Variety to me! Amy, definitely! I would just like to know what breeds. Not that it matters - he's my little mischievous sweetie! All this garden talk has me inspired to get one myself! I need to pick up that book and see if it's doable this year. 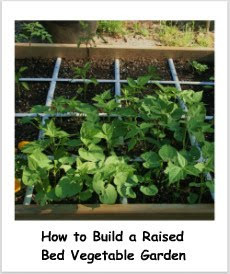 Have you tried to trellis your squash? Then each plant will only take one square out of your garden. 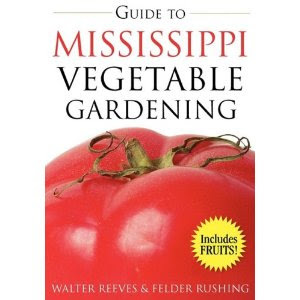 Just plant your trellised veggies on the "backside" (usually the north end, where they won't shade other plants). Place your trellis near the outside wall of the square for a fence-type trellis, or in the center of the square for a tee-pee style trellis. We're blessed with a pretty large yard,so this year we've tilled up a 50x33 foot garden. Our old 8x8 raised bed is in the middle of this patch of dirt. I'm planting an herb garden in the raised bed, and all my veggies and fruit around it. We're trellising our sugar snap peas, green beans, cukes, zucchini, straightneck squash, gourds, and anything else I can get to grown up instead of out. We took four metal fence posts (T-posts, like you use around pastures) and drove them into the ground, about two feet from the northern border (one of the 50' sides). 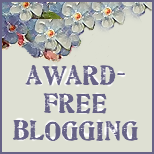 We took a roll of 3x3 metal fencing (about four feet tall) we had laying around and put it up on the posts, using wire ties to tie the fencing there, leaving the fencing about 3 inches off the ground. Now we have a nice, sturdy, rot-free "trellis" to grow our climbing veggies on. I planted my peas and other plants right at the bottom of the fencing. Almost anything can be come a trellis. If you have one post, a roll of sturdy string, and a few stakes, you could make a tee-pee style trellis. Two posts and a roll of string and you can run a fence-type trellis. This would make the amount of food you get from your garden substantially increase. Anyway, I think I've rambled on enough. I just wanted to throw that suggesting out there for ya. I really need to be at home, getting all my other plants in the dirt before it's too late. I have my seed started, but some of them haven't germinated yet. I'll give it until Monday (my next day off) and them I'm going to direct-sow what didn't germinate. Being in Alabama, they'll catch up quickly, I think.